There is a crippling outbreak of gastro sweeping through schools and childcare centres. Just yesterday five-year-old Amber was stomping through muddy puddles with my daughter. Bright, happy, vibrant her mother had today filled with plans for the pre-schooler. There were activities scheduled, a playdate and a whole heap of chores to get through. Until just before breakfast when Amber clutched her stomach and vomited across the kitchen floor. All plans were cancelled as the Pine-O-Cleen was retrieved from under the kitchen sink. The family of Amber, who happens to be my daughter’s best friend, bunkered down and lit up ABC KIDS with their fingers crossed that Amber just ate something that didn’t agree with her, rather than the alternative – that she was another victim of the growing gastro epidemic sweeping NSW. Amber, alongside my daughter, Emme. Image supplied. 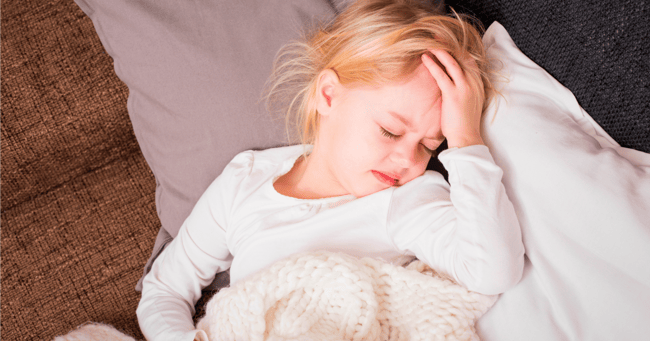 There is nothing that quite strikes the same kind of fear in a parent as when their child is sick, though it is perhaps nearly equalled by the news that your child&apos;s closest friend might just have a contagious strain of gastro. Just yesterday we learnt that 49 separate outbreaks of gastroenteritis have been reported in childcare centres and aged-care facilities in the past three weeks across NSW - some linked to the norovirus strain. The recent wave of gastro brings the total number of outbreaks from the start of June to 98 – seeing more than 3300 young children and adults in NSW emergency departments in just the last two weeks. NSW Health figures show that gastroenteritis cases have outstripped influenza cases in peak flu season, and frighteningly in school holidays leaving experts fearful of what might occur now school has resumed. Health authorities actually suspect a new strain of the virus may be the cause of the outbreak. NSW Health director of communicable diseases Vicky Sheppeard said childcare centres and aged-care facilities were at particular risk. "We have seen a number of outbreaks," she told media yesterday. "Probably, most of the outbreaks have been in childcare centres and you can imagine it&apos;s hard to maintain high levels of hygiene with children in child care. "So once the bug does get into a childcare centre it does spread very rapidly." It&apos;s with this in mind that Amber’s mother, Cassandra, has decided the best course of action today is to bunker down. With two other school aged kids it’s the last thing I need, she tells me. “Fingers crossed it&apos;s just an upset tummy, there is nothing worse than a strain of gastro sweeping through a household. That’s one nightmare I’d like to avoid." The fact that Amber spent the day yesterday with my own five-year-old has me crossing my fingers for her too. The number of young adults admitted to hospital is significantly above the five-year average. Image via iStock. NSW Health says that children aged five and under and young adults aged between 17 and 34 have been the worst affected by the new outbreak, with more than 800 of the cases in the last two weeks so serious the patient was admitted to hospital. Dr Sheppeard said it was quite unusual to have such high levels of gastro in winter since the ­rotavirus vaccine had been introduced. “This year has also been unusual in that there have been a lot of otherwise presumably healthy, young adults presenting,” she said. In fact, the number of young adults admitted to hospital is significantly above the five-year average. Wash your hands! Image via IStock. Dr Sheppeard urged people to wash their hands regularly and to stay away from work, schools or childcare centres for at least 24 hours if they became sick with gastro-like symptoms. Symptoms of gastro include nausea, vomiting, diarrhoea, fever, abdominal pain, headache and muscle aches and it can be highly contagious. People infected can spread the virus from the day they start to feel ill to at least two days after diarrhoea or vomiting stops. People infected can spread the virus from the day they start to feel ill to at least two days after diarrhoea or vomiting stops. Image via IStock. Dr Vincent Ho, a clinical academic gastroenterologist from Western Sydney University told The Conversation said that when a child had gastro it was better to feed them a form of oral rehydration therapy over plain water, as water simply doesn’t have the essential electrolytes required to maintain electrolyte balance. It is important to watch out for signs of dehydration in a person with gastro, including thirst, dry or sticky mouth, reduced urine volume, headache and dry skin that doesn’t bounce back when you pinch it. Severe dehydration is serious and can lead to a rapid heartbeat, rapid breathing, sunken eyes and a reduced level of consciousness. In babies under six months who are breastfed he said to continue breastfeeding. Shauna&apos;s daughter Emme and Amber... in healthier times. Image supplied. While Amber and her family wait to see if she has the dreaded lurgy, the best advice any of us can give is to bunker down, stock up on the hand sanitizer and hope for sunny days ahead as your washing line is sure to get a work out. Hope you feel better soon Amber. Emme and I will drop a care package on your front door... just don&apos;t worry about coming to say hello. We&apos;ll catch up in 48 hours. * Via Better Health Victoria. • generally feeling unwell, including lethargy and body aches. Via The Department of Health. • Wash hands with soap and water after using the bathroom and changing nappies. • Wash hands with soap and water before eating, or preparing food for oneself or others. • Do not prepare food for others while you have gastroenteritis, or for at least 2 days after diarrhoea or vomiting stops. • Immediately remove and wash clothing or bedding that may be contaminated with diarrhoea or vomit. • People who are ill with norovirus or suspected viral gastroenteritis should be excluded from childcare, school or work for a minimum of 48 hours after diarrhoea or vomiting stops.